If you wanted to see a free-flowing, high-scoring contest then this match was the one for you. Both sides had turns in front in an incredible 23-goal opening half, but the Bombers were never headed in the final two quarters. Orazio Fantasia and Shaun McKernan each booted four goals for Essendon, while Mason Wood led the Roos with three majors. Zach Merrett – with North tagger Ben Jacobs a late withdrawal – and Shaun Higgins were the most dominant performers for their sides with 32 and 31 disposals, respectively. No-one won more of the ball than Dyson Heppell’s 34. 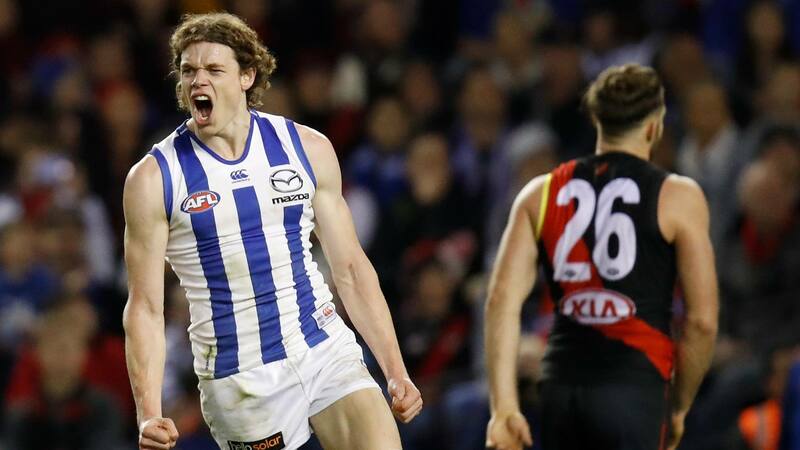 What it means for North Melbourne: The chance to gain momentum. Last week’s win over Adelaide relieved some pressure, but back-to-back victories – over another finals aspirant – would be a significant statement after the early season struggles. What it means for Essendon: A top-eight berth. The murmurings about John Worsfold’s job after round two would be a distant memory if the Bombers register a third win on the trot and move ahead in the win-loss ledger. How North Melbourne wins: The Roos’ defensive efforts were vastly improved last week, including their previous problems at stoppages. Their ability to contain Essendon’s high-octane offence is the key to them backing up their round four victory, but they will likely also have to be more efficient offensively. How Essendon wins: Bottle last week’s performance and pop the cork at the first bounce on Good Friday. That effort against Brisbane was what the Bombers need to replicate more often – and for longer in matches – if they are to live up to the pre-season hype. The stat: North Melbourne has won 12 of the 18 matches between the clubs at Marvel Stadium, but dropped the past two games, which saw each side score more than 100 points in both. Even more than usual, the midfield looms as the key to this contest, so whomever gets on top in the ruck could be the difference. Goldstein (25th in the Official AFL Player Rankings) picked up coaches’ votes for his effort last week against the Crows, but faces stiffer opposition against Bellchambers (69th). Wright will play his first AFL game for the year, replacing suspended defender Luke McDonald. With Marley Williams out, too, Wright will have the job on Anthony McDonald-Tipungwuti or Orazio Fantasia. Either way, the Roos need him to limit the damage if they are to win.